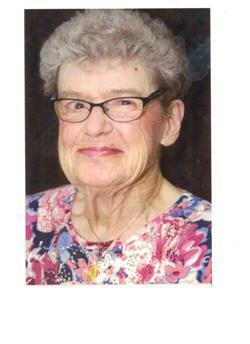 The death occurred peacefully at the Prince County Hospital on Sunday, December 9, 2018, of Marie Anne Arsenault at the age of 84 years. She was presently residing at Le Chez Nous in Wellington. Born on July 18, 1934, Marie was the daughter of Victorin and Eufrida (Gaudet) Arsenault of St. Chrysostome. She leaves to mourn her brothers Nazaire (Ned), Percy (Gina), sisters Lucia (Edmond), Jackie (Melvin) and Antoinette (Ivan), brothers-in law Ivan Pineau, Louis Bilodeau and sisters-in-law Eveline, Rita, as well as numerous nieces and nephews. Marie was predeceased by her parents Victorin and Eufrida, her brothers Louis, Leonard (Claudette), Edgar, Raymond, sisters Leona, Irene and sisters-in-law Merina. Resting at the Evangeline Funeral Home, Urbainville, for visitation on Tuesday, December 11, 2-4 p.m. and 7-9 p.m. Funeral mass will be celebrated at St. Philippe et St. Jacques Church, Baie Egmont, on Wednesday, December 12, at 10:30 p.m.
Interment to take place at a later date. Donations in Marie’s memory can be made to Le Chez Nous or to the Canadian Cancer Society. Online condolences may be sent to http://www.peifuneralcoops.com/Evangeline.php.